During the summer of 2009, members of the Warwick team are undertaking experimental investigations in DHI’s wave-current facility in Denmark, to investigate the pollutant dispersion generated by longshore currents. The joint study between The University of Warwick and The University of the Aegean, Greece is principally aimed at understanding the fates of pollutants in nearshore coastal regions. Project leader Dr Jonathan Pearson commented "This work is essential to improve fundamental understanding of nearshore hydrodynamic processes contributing to pollutant mixing. The resulting predictive techniques will be beneficial to consultant engineers, coastal managers, local authorities and government agencies responsible for water quality. Data on the nearshore hydrodynamics and dispersion will improve the verification of numerical models, which will allow a better understanding of how wave activity transports pollutants and nutrients". The research focuses on waves which approach the shore at an oblique angle, resulting in a wave driven longshore current. Regular and random waves are being studied and direct solute tracer measurements allow the on-offshore pollutant transport to be quantified. Laser Doppler Anemometry measurements are also being undertaken, which will provide unique turbulence measurements in and around the surf-zone. This data together with the direct tracer measurements will allow validated algorithms to be developed that describe the contributions to pollutant dispersion in the nearshore zone produced by combined wave-current processes. 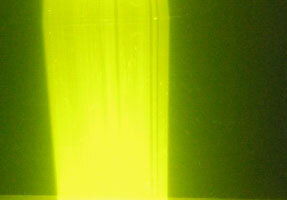 The project is principally funded by the EU’s Hydralab III project, with additional funding via Warwick’s URSS. Further information can be obtained by contacting Dr Jonathan Pearson. 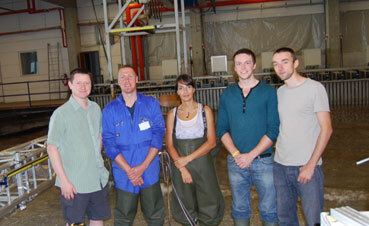 Warwick Water in Denmark (Left-Right): Dr Jonathan Pearson, Dr Andy Shaw, Alexandra Spyropoulou (UoA), Lewis Howard (URSS) & Jack Matthewman (URSS). Left: Solute tracer release in surf-zone and subsequent spatial collection, and recording of tracer.